Playing catch-up on my Splitcoast Mix-Ability challenges. This also works for the sketch challenge today at Splitcoast. Janelle’s challenge was to either use die cuts to create stencils or to create a window with die cuts. As you can see I chose the first option. Using my Verve Flutterby dies, I created a stencil with several of the butterflies on it. Next it was placed over my designer paper and inked with Distress Ink. TIP: Verve dies have registration holes on them for placement but I simply covered those with washi tape before inking. Next, I used a template and sponged Distress Paint in a coordinating color through the template to add the pattern to the butterflies. I brightened up the sun with a Faber-Castell big brush pen because my focus was “brighter” days. Next I cut a banner in aqua card stock and using the same template, added the same pattern in a random fashion, again with Distress Paint. The edges were all inked with Walnut Stain Distress Ink. The Verve Pennant Trim die was used across the bottom of the banner. It’s also been inked with the Mustard Seed and Walnut Stain Distress Inks. Then, I stamped and die cut the sentiment with another Verve die, inked the edges with both Mustard Seed Distress Ink and Walnut Stain Distress Ink. I sponged a wee bit of the Mustard Seed on the “brighter” portion of the sentiment. And finally, what better way to say “brighter” than to add some bling, right? Hope you are having a day full of sunny skies and butterflies! This is just so lovely! One of my favorite color combos, and I love the scattered bling. Such a sweet color combo and design! Fab card Lee-Anne! Great job on this card, Lee-Anne. 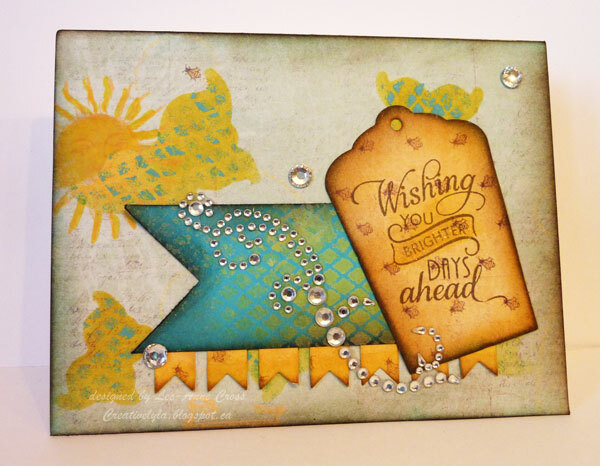 Wow, it is a true 'brighter days' card. I love the beautiful colors and your pretty butterflies. The sentiment tag and banner are fab. You still have 3-4 ft. of snow? Oh, no!!!!!!!! I agree your roses are going to be a while yet. Sorry. We're in the 80's today but storms are on the way in the wee hours of the morning. Yikes!